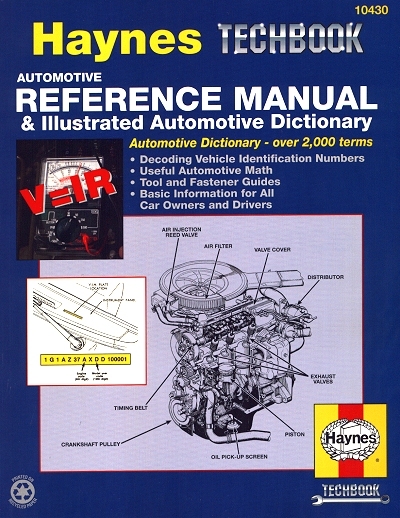 The Haynes Automotive Reference Manual and Illustrated Automotive Dictionary is a must-have guide for the dedicated do-it-yourselfer or for the professional mechanic. This reference manual will show you how to decode VIN numbers, so you will know what you're looking at when shopping for a used vehicle. You want a dependable vehicle? This manual will show you how to maintain it for maximum performance , economy, safety and reliability. Are there any recalls or repairs you should be aware of? This book gives you details on who to call to find out, whether you're entitled to coverage, how your vehicle's warranty may be affected, and more. Are you puzzled by all those numbers and letters on your VIN? Do you even know what a VIN is? Do you know what to look for - what to really look for - when you're shopping for a used car? Do you know where to call to find out whether your car, or some component or system on your car, is being recalled? Do you know how to set up a routine maintenance program for your car, or prepare it for an emission or safety test? How about getting it ready for a big road trip? Have you ever wondered what exactly a "monolithic substrate" is? Well, the Haynes Automotive Reference Manual and Illustrated Dictionary of Automotive Terms will answer these questions and a whole lot more. Look through the Table of Contents and we're sure you'll agree that our reference manual has a whole lot of useful information in one easy-to-read volume that you just won't find anywhere else. The Vehicle identification number, or VIN number, as it's usually called, is a long string of numbers and letters imprinted on a small plate located on the driver's side of the dashboard. Everybody knows that these numbers are the means by which a vehicle is identified by the state in which the vehicle is licensed and registered. But what most people don't know is that those numbers mean a lot more than simply the "number" of a vehicle. Once you know what each individual number or letter represents, you can learn all sorts of information about your vehicle. We'll only deal with the two most important characters of the VIN - the model year code and the engine code (which will reveal the number of cylinders, displacement and in some cases, the type of fuel system). Always refer to the VIN number when you're buying parts for your vehicle. Ask a question about Automotive Reference Manual & Illustrated Dictionary.